I mentioned recently that my biggest failures always have an audience. Dan’s sister Megan, her husband John, and their daughter Meredith have been on the receiving end of some of the worst desserts I’ve made. The first time I ever visited their house, I made a frozen lemonade pie that melted in the car (I underestimated the Northern Virginia I-95 traffic). Since then I’ve served them such lowlights as gummy hand pies and a pumpkin pie that tasted like nothing. It’s a miracle they’re still willing to try what I serve them. This weekend they invited us over for dinner and I was given the option of bringing dessert or salad, and I chose the opportunity to redeem myself. It took me a week to come up with the perfect choice. When I saw them in West Virginia a few weeks ago I brought my bourbon white peach pie, so I knew peaches were out. In May I served them banana cream pie, so that was off the table. I’ve made so many mountain pies this summer that I didn’t really want to do that, and anybody can serve a cherry pie. I wanted something fresh! Something that was light and rich but could withstand an hour’s drive from one end of the D.C. area to the other. Something that would suit the tastes of two foodies and a precocious three year old. My first step was to settle on a fruit. I knew I wanted a berry, but wasn’t sure which one. I’d been working with strawberries and blueberries all summer, so I narrowed it down to raspberries and blackberries. Ultimately I chose to work with raspberries because I wanted their color. 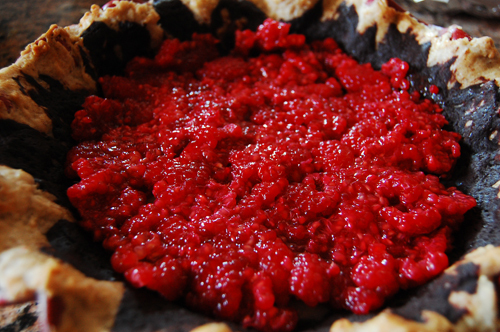 That splash of red, not to mention the tart, fruity flavor it brings, is the perfect compliment to the rest of the pie. After I decided on raspberries, I thought about what to pair raspberries with. My mind flew at first to something akin to a chocolate pie, before I decided it was too heavy. In mid-August you want a dessert that refreshes you, that compliments things like peach soup and corn on the cobb. Something like chocolate mousse. 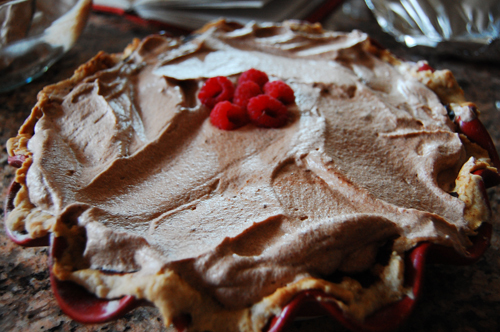 After I had mentally constructed the pie and it’s layers- the ganache to give a rich chocolately essence, the mousse with its light and creamy texture, and the raspberries to make it all pop, I needed a name. 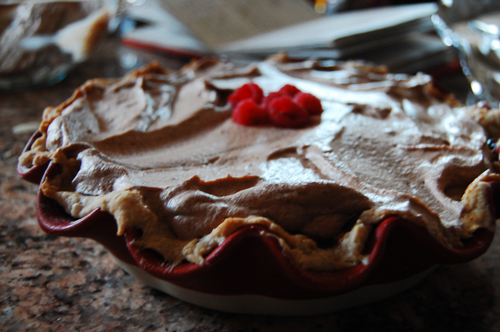 After tossing around the names that Meredith and I liked, things like chocolate raspberry pie or chocolate mousse pie, John suggested a name that trumped them all- Brake for Mousse pie. That is, until Meredith pulled out a (talking) card she had received for her birthday, which wished her a “pony magical day.” And if there is one definitive way that I would describe this glorious pie, it would be pony magical. Begin by making your pie crust. Lay it into the dish and bake it at 350 for 25 minutes, or until cooked through. Allow to cool. 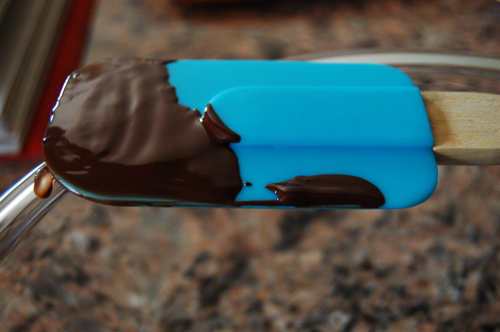 In a double boiler, melt chocolate, spices, and heavy cream, stirring occasionally. Pour into the bottom of the pie crust and allow to cool overnight. 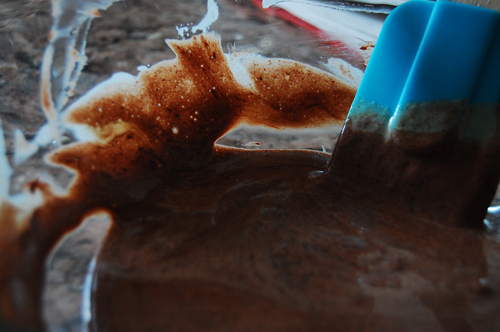 Your next step is to make your mousse. Then, use a pastry knife or a fork to crush 3/4 of your raspberries. Spread the crushed berries on top of the layer of ganache. Spread your mousse on top of the raspberries in an even coat. Top decoratively with the remaining raspberries and allow to set at least one hour, or overnight.